The fire has been extinguished, but you should expect street closures in the area around the Willard and W hotels overnight. 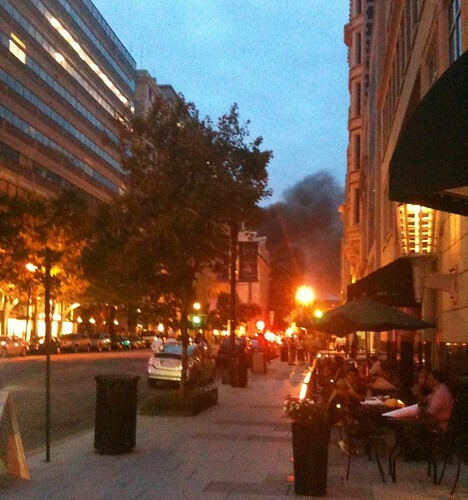 An underground transformer caught fire under 14th & F Streets NW, causing evacuations of the Willard Hotel, the W Hotel near the White House and Treasury Department. The Secret Service has closed 15th Street. As you might expect, power is also out in the area. Avoid it altogether if you can. Watch this post and our Twitter feed for updates. You may recall that it was also an underground transformer that caused the fire in the office building in north Dupont on Thursday. 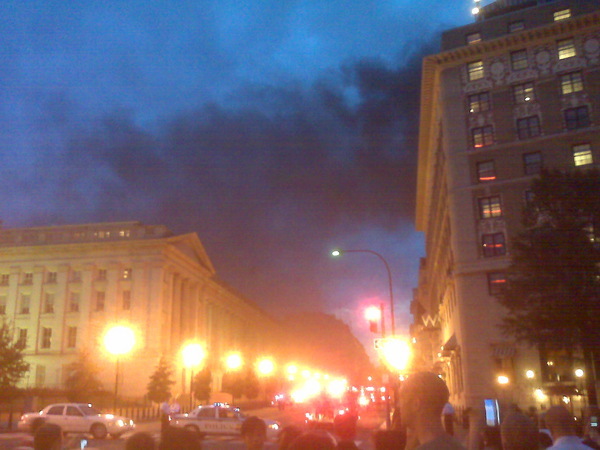 Update 8:45: DC Fire & EMS report that they are containing the fire, but from time to time flames are erupting. They’ve called in the HAZMAT and foam teams to assist. Update 9:00: Video taken shortly after the evacuation. Video from Frank Gruber, techcocktail.com. Update 10:00: Fire department spokesman Pete Piringer described the flames shooting 25 to 30 feet from the pavement, but says they were controlled pretty quickly. Update 10:05: TBDTV reports that power is starting to come back on in the area after it had been shut down as a precaution. The area around 14th & G will be shut down for several hours to come. Update 10:20: Power should be restored to the Willard Hotel in 45 minutes to an hour, according to @willardhotel. The Willard guests will also be permitted back into the hotel shortly.